As I sit listening to the prayer service I am too processing the events of Monday. I wrote up some thoughts and I continue to have emotions that need to be dealt with. I find myself the last couple days being shocked by how little the events of Monday are effecting people. Some people are still driving around in there typical Boston MASSHOLE driving- cutting each other off and flipping each other off. I was shocked at how little the people I work with seemed effected. Business as usual. I sat at my desk the last couple days and couldn't function as Business as usual. I got things done but just didn't have that same amount of brain power I usually do. I find myself reaching out to fellow runners to feel a little more comforted in what I was going through. I couldn't put the feelings into words very well- it was a heavy heart with my brain racing of all the friends and family and the what ifs. Yesterday the news buzzed while I was at work and then there was another bomb threat. 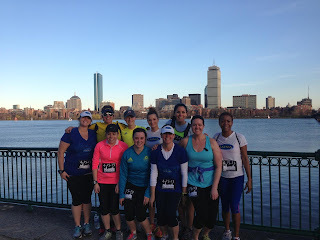 I sat at my desk and for a minute considered not heading into the city for my Boston Luna Chix team run. I wondered if I would be putting myself in a situation I shouldn't, but I realized I can't live my life that way. I rode into Boston listening to the news and stories about victims recovering. Our run location changed from Newbury, one block from the blast, to the Cambridge side of the Mass Ave Bridge. 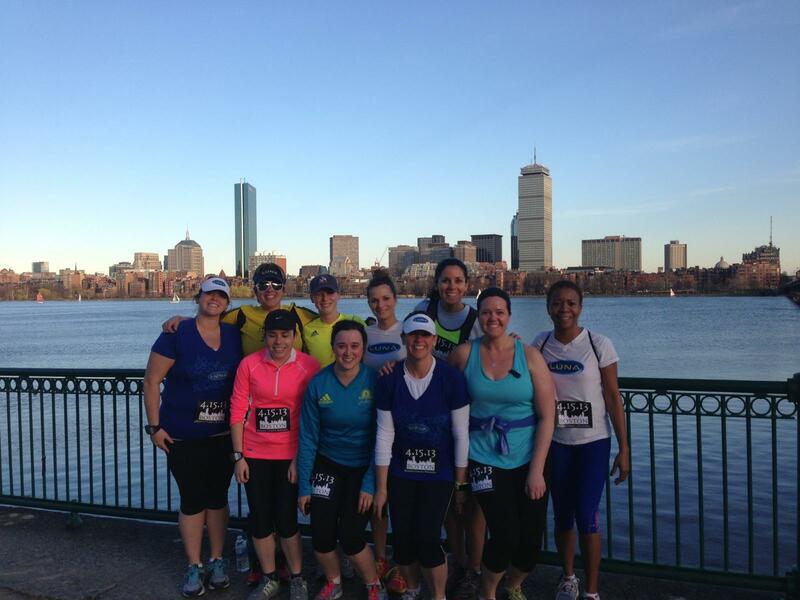 We gathered and put on bibs Boston Runners United to Remember. As we took a picture a random stranger asked to take one too he thought it was so great we were all out there in the bibs. As I ran I chatted with my team mates and the other ladies that joined us. We talked through some of our emotions, some of our fear, some of our pain. I started to feel the healing begin. 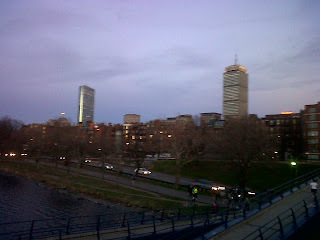 Somewhere along the Esplanade by that lovely dirty Charles I realized I needed to go see Boylston. I asked if anyone wanted to join me. I said out loud I had a feeling I may chicken out on my way there and I might breakdown but I needed to go see it. So 4 of us ran down to Boylston right to the corner of Hereford. That infamous "Right on Hereford Left on Boylston" turn to the finish. The 4 of us arrived and there were probably 20 other people standing there. Mostly just in silence. We got up against the fence and watched and took it all in. I don't know how long we were there, long enough for the crowd to swell to more like 50. We talked a bit but also didn't talk. Ashley said to me it is so amazing how a place can go from so happy an joyous and supportive for EVERYONE to that. And I have to agree. I find racing to be the one environment where everyone is supportive, no one is cheering against anyone. EVERYONE is there cheering. EVERYONE is there to uplift EVERYONE. And even though on Monday afternoon that changed at the Boston finish line I have 100% confidence that that environment will never change! EVERYONE will always be at those events to support EVERYONE! So I have to say I saw it and it helped. It really helped me process the events process the emotion. I think spending time with my family of runners helped me process. Seeing Boylston was what I needed to realize that I may not be okay right now but it will be okay eventually.